In European legends, the bite of the werewolf involuntarily turns a hapless victim into a fuzzy-wuzzy killing machine. In American pop culture, zombies prey on the flesh of living innocents who then become skulking face gnawers themselves. In mother Russia, clock punches you. All of these contemporary Western tales portray human atrocities committed by victims of circumstance – upstanding citizens who happen to get cursed, infected or punched by clock, and then go on to act as involuntary proxies for the new and accidental darkness inside them. According to certain Navajo lore, Skinwalkers – dark witches who possess the ability to, among other things, transform into animals – are former high priests who have murdered blood relatives. In other words, it’s a story of active unholy transformation knowingly catalyzed by conscious decisions. Remember the Algonquian story of the Wendigo – the man who engaged in cannibalism and, as a result, turned into an eternally suffering flesh-craving beast? Skinwalkers are similar in that they are men (occasionally women) who undergo a monstrous transformation by way of a culturally forbidden act (in this case, intra-familial murder). (Granted, there are versions of the story in which Skinwalkers are simply Anakin-esque flock strayers who end up on the wrong side of the force, but I would assume that that’s equally frowned upon.) Whereas the Wendigos are forever damned to tormented lives of feral scavenging and desperate murder, Skinwalkers are powerful, deliberate and feared. Both legends, however, use the threat of once-human monstrosities to demonstrate the corruptive power of sin (“sin” meaning, in this case, culture-specific social malfeasance). 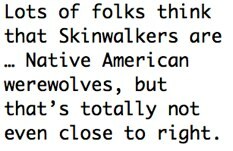 Lots of folks think that Skinwalkers are kind of like Florida’s Skunk Ape – culturally variant analogs of a familiar supernatural beasties – and regard them as Native American werewolves, but that’s totally not even close to right. Unlike werewolves, Skinwalkers transform at will, and can change into any animal of their choosing. These transformations allow Skinwalkers to travel swiftly and easily elude capture. Their shapeshifting abilities even extend to their voices, which can mimic any animal or human sound, up to and including “Sky Pilot” by human band “The Animals.” They can read thoughts, and, in some versions of the legend, even project themselves, by way of a hypnotizing stare, into their victims’ bodies, which then become mere skins in which the monsters walk (though the name “Skinwalker” actually [boringly] comes from their proclivity toward animal skin attire). As acolytes of the Witchery Way (a form of Navajo magic centered on death and corpses), Skinwalkers can use enchanted bone dust to paralyze, or even kill, their chosen victims. Mostly, though, Skinwalkers are scary because they are self-aware, they are clever and they are malicious. They are monsters because they chose to become monsters. This Navajo legend holds individuals accountable for bringing evil into the world; werewolves and all those other stories? The excuses of desperate children pointing their guilty fingers toward the darkness of caves and the mystery of nighttime forests.